Hawk species are known for their speed, particularly when chasing prey. During ordinary flight, a red-tailed hawk, which is the most commonly seen hawk in North America, might be a little slower than ducks or geese, but when he goes into a dive, he's like a highly tuned racing car. Flight speed for all birds is within the range of 20 to 50 miles per hour, according to the Northern Prairie Wildlife Research Center website. The Center points out that larger birds typically fly faster than smaller species during sustained flight. Estimates suggest, for example, that ducks and geese travel at about 50 miles per hour, whereas hawks generally have a flight velocity between 22 to 28 miles per hour. Measurements of red-tailed hawk flight suggest he travels at between 20 and 40 miles per hour, according to AvianWeb. The peregrine falcon is a bit faster at 60 miles per hour. Hawks achieve a more spectacular speed when they swoop down to catch prey, which they can spot from a distance of 100 feet. 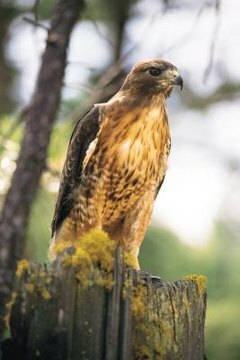 The red-tailed hawk dives at a speed of at least 120 miles per hour. The peregrine falcon can achieve a speed of 150 miles per hour.